OpenVPN tunnels all your traffic. When you only want to browse anonymously (with your seedbox IP) that is unnecessary. Setting up HTTP proxy is easy and only takes couple of seconds. In host name fill your server name. Scroll down to Connection, SSH and select Tunnel. In Source port type in something like 12345 (you can use any combination of numbers). Select radio buttons Dynamic and Auto and then press Add. Still under Connection select Data and fill in your bytesized username. When you open Firefox open up Options which is under Tools. Go to Advanced, choose Network tab and then Settings. 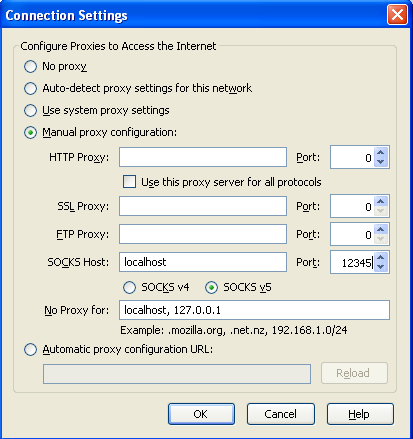 Choose Manual proxy configuration"and fill in SOCKS Host with localhost and Port with the one you set up in PuTTY. Save the changes. When you start PuTTY, choose the connection that was saved and click Load. Open will open the putty window and ask for your password. Password is the application password located at your bytesized Dashboard. PUTTY must be open for your tunnel to work. There is a chance that site block is more sophisticated and includes DNS blocks in which case http tunnel won't be able to load the website(unless you know the IP). In that case you should try using OpenVPN or using HTTP tunnel with DNScrypt. If you manage to successfully use DNScrypt and want to help out by writing a step-by-step wiki please contact us via the ticketing system.